As unlikely as this sounds, it works. I had a fun time, even as the film spun vertiginously from outrageously violent ‒ we open with a Chicago thug being drawn and quartered under the Hollywoodland sign — to hilariously cartoonish. The setting is Los Angeles, 1949. It’s all klieg-light glitz, home to the Slapsy Maxie Club and Carmen Miranda. John Brolin plays Sgt. John O’Mara, a square-jawed war hero who has been charged by his equally chiseled chief (Nick Nolte) with ending Cohen’s bloody reign. “This isn’t a crime wave,” the chief tells him, “it’s an enemy occupation.” And their mopping-up campaign will be “off the books,” an extra-legal guerrilla battle. Completing O’Mara’s Magnificent Six: a smart-mouth ladies’ man (Ryan Gosling doing a mumbling Steve McQueen), a cop who’s handy with a knife (Anthony Mackie subbing for James Coburn’s Britt), a legendary vet who sports holster and Stetson (Robert Patrick), an intelligence “brain” (Giovanni Ribisi), and a tag-along Hispanic (Michael Peña filling in for Horst Buchholz). Mireille Enos and Emma Stone play O’Mara’s bull-dog protective wife and Cohen’s favorite tomato who takes up with Gosling. Given the mucho macho material, they acquit themselves well enough. 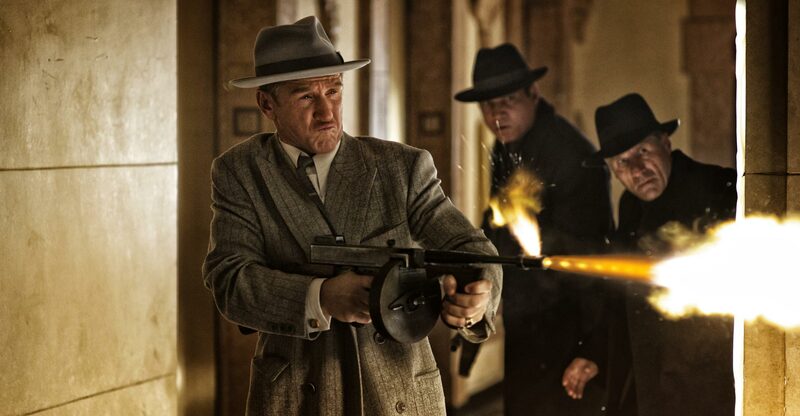 As for the gangster squad, they’re given little to do other than dodge lead in a series of car chases and ambushes (excluding a theater fusillade, axed after the Aurora massacre). This they do with jocular authority, which, especially in Gosling’s case, says, “Hey, gimme a break ‒ it’s all for laughs.” Two-time Oscar winner Penn goes further: his certifiable crime boss makes De Niro’s Capone seem serene. He froths at the mouth so much he disappears behind a mask of spittle.